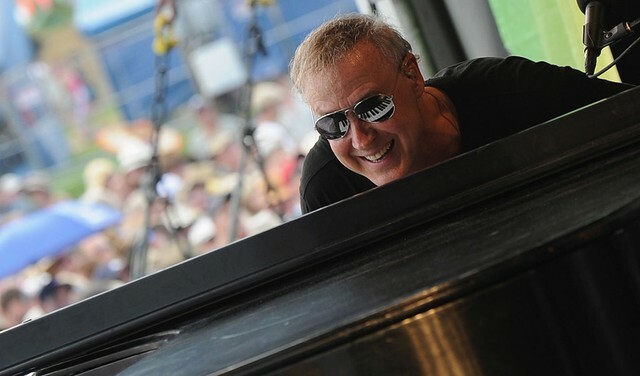 If you think of Bruce Hornsby only as a mulleted late-‘80s smooth-rock lifer, making music somewhere off the coast of Sting’s solo career, then you haven’t been paying enough attention. A cursory sampling of the Virginia singer-songwriter’s new album Absolute Zero will evince how winding his journey has been since his 1986 breakthrough with the #1 hit “The Way It Is,” a song that’s remained ubiquitous enough over the years to give him an unjustified reputation as a one-hit wonder. From hyper-virtuosic jazz improvisations to traditional bluegrass to sample-heavy post-electronica, Hornsby’s long career is a lot stranger, more richly idiosyncratic, than that label would have you believe. At times, Absolute Zero has a quality that recalls Hornsby’s formative work. “Cast-Off,” the album’s mournful lead single featuring Justin Vernon, reminds us how much of the Bon Iver songbook could be considered Hornsby fan fiction, and the Americana-tinged “Never in This House” could have reasonably been an outtake from Hornsby’s first album. But much of Absolute Zero is not “smooth” in the traditional sense. Hornsby’s intricate and impressionistic piano parts jut out at odd angles in the mix, the result of nearly 30 years of experimenting with 20th-century classical and avant-jazz styles—both playing them straightforwardly and incorporating borrowed elements into the pop song form. You get a taste of the more bewildering side of Hornsby’s genre-bending tendencies here, too. “Voyager One,” a song about the satellite of the same name and the sordid future of the human race, combines classical minimalism, bluegrass fiddle rhythms, and swing in a way that is either totally anti-musical or a stroke of mad genius. “Echolocation,” a bass-less oddity about a lost man on the other side of a DUI charge, combines lonesome country blues with John Cage prepared piano samples. “How did we get here?”, fans of classic rock radio might reasonably ask, after listening to this ambitious, bizarre, sometimes beautiful album. Truthfully, it’s not hard to make sense of if you realign any conceptions you might have had about Hornsby being an anodyne AM-radio crooner. Instead, think of him as he truly deserves to be considered: a huge, brilliant weirdo. This doesn’t only extend to his discography, mind you. Hornsby has remained a curious presence in broader pop culture, and an enigma personally as well. (Did you know he could have been an NBA star?) The following primer is designed to guide you through the strangest aspects of the Hornsby mythos, from well-known tidbits to largely forgotten artifacts. His fame grew as the result of a Tupac song. One of the best-known aspects of Bruce Hornsby’s career is pretty odd in itself. After the breakout success of his debut album The Way It Is-–which earned him a Best New Artist Grammy win in 1987—Hornsby’s cultural ubiquity was solidified for a new generation of music fans in the ‘90s, thanks to a sample in “Changes,” a mournful hit by the West Coast’s most notorious gangsta rapper. And it wasn’t just Tupac who used “The Way It Is,” Hornsby’s sole No. 1 single, for hip-hop source material. E-40 interpolated the track on 1996’s “Things’ll Never Change” and Mase would go on to use it on his 1999 Double Up cut “Same N*ggas.” Also check out MC Buzz B’s “Never Change” and this 2008 Snoop Dogg and Charlie Wilson collab. Who doesn’t love some Hornsby? He played in the Grateful Dead. Hornsby has always been a jammer: even “The Way It Is” features not one but two positively rippin’ piano solos. Still, non-devotees may be surprised that the smooth-pop don had a stint playing keys (and occasional accordion) in the Grateful Dead. Hornsby began sitting in with the long-running group in the late ‘80s, and came on as something like a full-time member in 1990, after the death of previous keyboardist Brent Mydland. The early ‘90s were not exactly the Dead’s artistic heyday, but Hornsby had his moments, sprinkling graceful melodic lines into the crevasses of the band’s jams, his spacious approach to the piano nicely complementing their richly polyphonic sound. Sometimes, they even let him do a little singing. (In addition to being an underrated player, he was a more traditionally powerful vocalist than either Jerry Garcia or Bob Weir.) You can hear him belt out a few lines in the middle of this rousing version of “Jack Straw” from 1991. He won the Grammy for Best Bluegrass Recording in 1990. He played at Woodstock ‘99. He’s written roughly over 200 pieces of music for Spike Lee movies. He’s a bit of a prankster. He plays insane medleys in concert. In 2000, Bruce Hornsby released his first live album, a double-disc outing with his 2000s band The Noisemakers. Here Come the Noisemakers captured the band’s adventurous spirit, and stands as the definitive document of Hornsby’s jammy approach to live performance, which usually involves covers and offbeat musical humor incorporated into medleys with his own compositions. At one point on the album, he introduces “The Way It Is” with a long piano solo that incorporates George Gershwin’s 1935 Porgy and Bess standard “I Loves You Porgy,” and a piece by 20th-century composer Samuel Barber; later, he deploys a Bill Evans tune referencing 12-tone atonal music as a bridge into Spirit Trail’s working-class complaint “King of the Hill.” On the Noisemakers’ 2011 follow-up live album, Big Bruce riffs on avant-garde classical works by Charles Ives, Anton Webern, and Elliott Carter—all in the interest of playing nothing but the hits, of course. He made an experimental album inspired by Kid A in 2002. He recorded a bluegrass version of Rick James’ “Super Freak” with Ricky Skaggs. He debuted an unheard Ornette Coleman composition on one of his albums. He plays a crucial role in the 2009 film World’s Greatest Dad, directed by Bobcat Goldthwait and starring Robin Williams. He claims he beat Allen Iverson in one-on-one basketball after helping him get out of jail. In a recent interview with Uproxx, Hornsby acknowledged that the idea of him beating Allen Iverson at one-on-one basketball “seems completely ludicrous” and “not believable.” He’s not wrong. But it’s true, at least according to Hornsby himself, the “lots of witnesses” he claims were there, and the 2001 AI biography Only the Strong Survive, by veteran journalist Larry Platt, not the sort of guy who’d make something like that up. But it’s also true that the future NBA legend was still in high school when it happened, and that they weren’t exactly playing by the standard rule book. According to this Only the Strong Survive excerpt, Hornsby (who played high school ball himself) insisted on what he called “Piano Hands Rules,” which were meant to protect his precious ivory-ticklers. Possession automatically switched every time the offensive player took a shot, whether or not they made it, eliminating the possibility of a fight over a rebound. “I had one of those days where I couldn’t miss,” Hornsby said, and that was that. He’s the inspiration for one of Veep’s best jokes. Now, we’ll end this the only way we know how: with a video of Hornsby, B.B. King, Lou Reed, and legendary guitarist Jeff “Skunk” Baxter covering Bob Dylan’s “The Mighty Quinn” on Herbie Hancock’s ‘90s Showtime variety show—a cast of characters only Bruce could assemble.